According to the U.S. Department of Transportation, there are on average more than 950,000 automobile crashes each year due to wet pavement, resulting in approximately 4,700 deaths and 384,000 injuries. However, these safety and insurance tips below should help guide you to a safe and knowledgeable driving experience. Slow down, turn on your headlights, give a little extra room in front of you and watch out for deep pools of water when the road is wet. On rain- or snow- slick surfaces, cruise control may cause you to lose control. 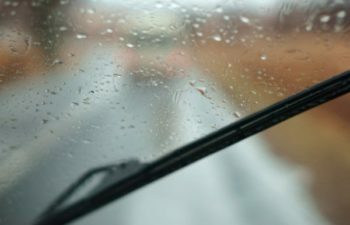 You might think it’ll help you stay at one steady speed, but if you hydroplane while you’re in cruise control, your car will try to go faster causing you to lose control. The first drop is the worst drop. The beginning of the rainfall is the most dangerous on the roads. Oil deposits in the pavement mix with the water to form a slick surface until the oil is diluted by the rest of the rain. You should avoid driving when it first starts to rain if you can help it. Blinkers don’t make it safer. Driving with your blinkers on can confuse other drivers who might think you are stalled or pulling over. Additionally, they hinder your ability to utilize turn signals normally. On top of that, it is illegal to drive with your hazards on in Florida, bad weather or not. When in doubt, pull over. Don’t be afraid to pull over if things get bad. Low visibility combined with slick roads is a dangerous combination. That means when the storm has particularly low visibility, safely pulling over until it lightens up is a good option. Beware of the “unavoidable accident” excuse from insurance companies. If you are in an accident during inclement weather, the insurance company can use this argument to try and deny your claim. The truth is- most accidents, even during bad weather, are avoidable, and the insurance company should honor your claim because of that. If you or a loved one are hurt in an accident Call Me On My Cell! Reach out at www.callmeonmycell.com or call at (888) 254-7119.